He holds the record for the world's youngest Grandmaster ever, having qualified for this title at the age of 12 years and 7 months. In March 2016 Karjakin won the Candidates Tournament 2016 to become the official challenger for the World Chess Championship. He lost the championship match to Magnus Carlsen in November 2016 in a rapid-play tiebreak. Karjakin won the 2012 World Rapid Chess Championship, the Chess World Cup held in Baku in 2015, and the 2016 World Blitz Chess Championship. He competed in seven Chess Olympiads, three times for Ukraine and four times for Russia, winning three gold, two silver and two bronze medals. 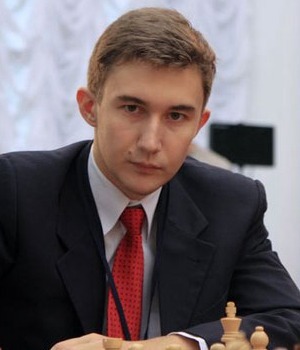 He also won the team gold with Russia at the World Team Chess Championship in Antalya in 2013. Karjakin participated in the last Candidates Tournament in 2018, placing third.